What is The Alexander Technique and how can it help me improve? Learn how to implement this ground-breaking technique into your every-day practice. Over the years, pianists have been placing considerably large amounts of strain onto the muscles and bones within their hands, wrists, arms and shoulders. Piano playing demands highly complex and physically demanding movements. Because of this, Repetitive Strain Injury (RSI) is almost a guaranteed occurrence in every pianist’s career. The Alexander Technique aims to help pianists improve the quality of their movements when playing. This improvement in quality of movement also handily leads to an improvement in the music quality itself. How? If you think about it, a pianist’s stiff shoulders and strained wrists are likely to affect the fluidity of the music being played. Here are the basic fundamentals of the Alexander Technique. Focusing mostly on the relationship between your head, neck and spine, Alexander Technique teachers will first analyse how you currently move before re-training the way you sit, stand, and play. The human head is heavy to say the least. That heavy load sits on top of our vulnerable spine. Our spine works as one, meaning that - when we place pressure on our neck through bad posture - the whole spine is affected. 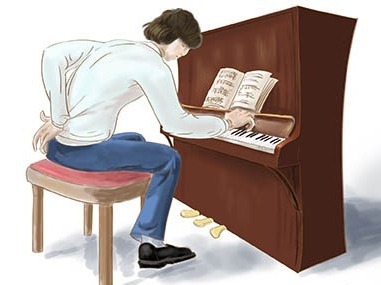 Frederick Matthias Alexander therefore concluded that the key to a healthy posture is being able to naturally release the pressures within the muscles and bones relating to piano playing. The most effective way of utilising the Alexander Technique is to find a teacher. Your lessons will consist of your teacher observing your posture and movement patterns. She will also supplement the visual information in a very important way by using her hands, gently placing them on your neck, shoulders, back and so on. The teacher is using her hands in order to get more refined information about your patterns of breathing and moving. To help her with this, she will probably ask you to perform some simple movements - perhaps walking, or standing up or sitting down in a chair - while her hands are kept in easy contact with your body. Can’t book a teacher? Here are some tips on how you can start to implement the Alexander Technique at home. This is one of the best and most effective exercises. From a sitting position, take a moment to think about what your neck and head are doing. Let your neck be free. Without using your hands to guide you, simply let your neck lead you right up. Leading with your neck straightens out your spine as you stand. This is healthy for your spine. This is absolutely key if you are to successfully adopt a healthy posture. Take some time to sit down at the piano, and become aware of how you are sitting. Within the Alexander Technique, this is called ‘giving my directions’. First of all, pay attention to your neck. Work on freeing it. Find a position for it in which it is neither strained nor slumped. Second of all, pay attention to your sitting bones, which are situated at the bottom of your pelvis. Naturally relax them into the chair. Thirdly, direct your legs to free away from your hip joints. Fourthly, be aware of the relationship between your arm, wrist and hand. As you place your hand onto the piano, try and keep an ease and a freedom in all three of the joints. Once you feel you are completely aware of your posture when sat at the piano, try and implement this into some light practice. When doing so, do not worry about the accuracy of your playing. Instead, focus on your breathing, freeing your neck, relaxing your arms, and freeing your legs. For most people, Alexander Technique lessons are safe and pose no health risks. No manipulation of your body is involved, just gentle touch. The Alexander Technique isn’t for everyone, however. If you have long-term spinal injuries of any kind, it may do you more harm than good. It's important to remember that most teachers of the Alexander technique aren't medical professionals. They do not diagnose, offer advice on or treat conditions that should be managed by a suitably qualified mainstream healthcare professional.